Last month saw the local housing market buzzing with lots of activity and record-breaking gains despite all the rain we experienced. Closed and pending sales in May exceeded previous months’ numbers, but the area did see a slowdown in the number of new and active listings. 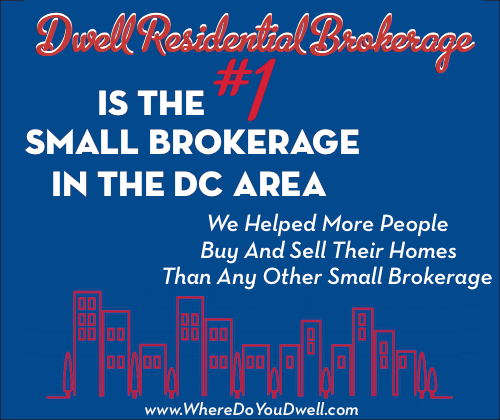 The stronger sales numbers compared to one year ago and from the previous month still demonstrate that the DC metro real estate is humming along just fine: Homeowners are selling their listed homes, and buyers are buying these homes. Sellers who have been waiting on the sidelines should consider jumping in to meet the demand of potential buyers. Sales volume for the region was more than $2.8 billion, up 11.4% from last May and up 19.3% from last month. Closed sales were up 12.3% compared to last year and were at a new decade high for the month. May was the 18th consecutive month of year-over-year increases in closed sales. New contracts (pending sales) increased by 3.7% to 6,385, a new May record. The median sales price of $430,000 for the area was up $10,750 or 2.6% compared to last month. It was slightly down 1.1% compared to last year. Active inventories of 11,072 listings were down 8.5% from last year and down 0.4% from last month. New listings of 7,436 were down 10.1% year-over-year and down 15.6% compared to last month. The average percent of original list price received at sale in May was 98.3%, up from last year’s 98.1%. The median days-on-market was 13 days, up one day from last year, and down one day from last month. Prices – Overall prices dipped slightly with only condos inching up a bit. May’s regional overall median sales price dipped slightly to $430,000, a 1.1% decrease over last year’s $435,000. 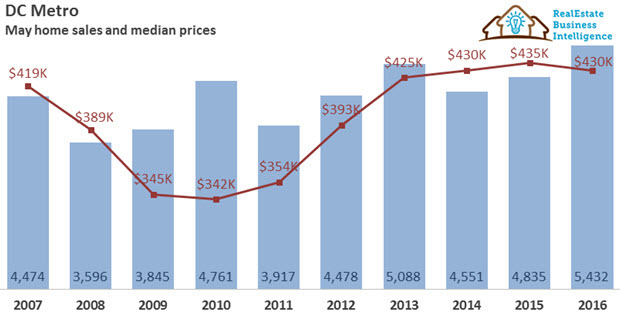 Only condo prices saw an increase, rising 1.1% to $310,500. Single-family detached prices declined 0.9% to $535,000 and townhome prices dropped 2.8% to $415,000. Prices are 1.8% and 8.5% above the 5-year and 10-year averages of $422,460 and $396,135, respectively. The overall regional price of $430,000 is 25.8% above the May 2010 low of $341,750. 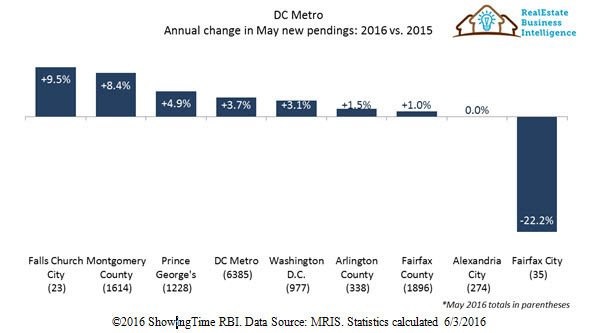 Prince George’s County continues to be the most affordable area in the region with a May median sales price of $250,000 (up 2.5% from last May). Fairfax City saw the largest percentage decline in median sales price, down 15.5% to $440,000, while Alexandria City saw the largest increase of 3.1% to $538,500. Closed Sales –A new 10-year May record was set with 5,432; and also it was the 2nd highest monthly level since August 2006. Sales were up 12.3% compared to last year’s 4,835 and up 16.1% compared to last month’s 4,678. Closed sales of 5,432 exceeded the previous market high of 5,088 in May 2013 by 6.8%. Sales were up 51.1% compared to the market low of 3,596 seen in 2008. Single-family detached sales were up 15.2% to 2,661, while condo sales were up 12.9% to 1,414 and townhome sales were up 6.5% to 1,357. Sales are 11.4% above the 5-year avg. of 4,877 and 20.8% above the 10-year avg. of 4,498. New Pending Sales – Contracts were above both the 5-year average of 5,954 and the 10-year average of 5,229. There were 6,385 new pending sales, up 3.7% compared to last year and down 3.9% from last month. May 2016’s new pending sales number surpassed the previous May 2015 high of 6,158 by 3.7% and was 65.9% above the May 2010 low of 3,849. With the exception of the weather-related dip in January of 2016, new pending contracts have increased year-over-year for 19 consecutive months. All property types saw increases compared to last year, with single-family detached up 4.5% to 3,195, condos up 3.4% to 1,591 and townhomes up 2.3% to 1,597. New Listings – With 7,436 listed this May – it was 24% above the 10-year low of 5,996 seen in 2010 and 25.7% below the 2007 high of 10,013. A 10.1% decrease compared to last year and a 15.6% decline compared to last month. New listings for single-family detached homes declined 12.8% to 3,691, townhomes declined 10.7% to 1,778 and condos decreased 4% to 1,963. 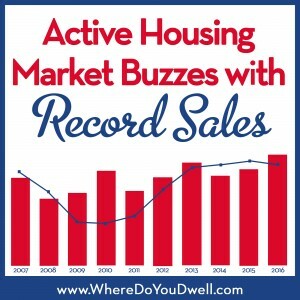 New listings were just barely above the 5-year avg. of 7,411 and the 10-year avg. of 7,428. SP to OLP ratio — On average, District homes sold at 99.8% of their original listing price, the highest in the region and down slightly from the 100% seen last year. The regional average sales price to original listing price ratio (SP to OLP ratio) for May was 98.3%, up just slightly from last year’s 98.1% and also up from last month’s 98.0%. Over the last decade, the region’s May average SP/OLP ratio ranged from a low of 91.9% in 2009 to a high of 98.7% in 2014. Days-on-Market — The median days-on-market was 13 days, up one day from last year, but down one day from last month. This month, condos had the highest median DOM of 17, while single-family detached had a median DOM of 13 and townhomes had a median DOM of 10. DOM are at the 5-year average of 13 days and below the 10-year average of 23 days. The lowest May DOM level recorded in the past decade was 9 days in 2013; the highest was 49 days in 2008. The highest median DOM is in Prince George’s County, where it is 19 days (up from 16 days last year). The lowest median DOM are in Washington D.C., where it is 9 days (up from 8 days last year).